Ildar Dadin inside of the police station, after his arrest in August 2014. In December 2015, Ildar Dadin was arrested and sentenced to three years in jail for peaceful street protests. He is the first person in Russia to be jailed under the new law that punishes repeated breaches of public assembly rules. I could not interview Dadin in jail but I am grateful for a chance to speak to his fiancée, journalist Anastasia Zotova. She shared Dadin’s story and answered a few questions, including this ever burning one: What can we, as the world community, do to help the world injustice? There are feasible, concrete steps that each of can make to proverbially “make difference.” TODAY. Says Zotova, “Repressions are coming back to Russia, and my family has become one of their first victims. Last December, my fiancé was sentenced to three years in prison for defending human rights. Ildar Dadin called on the Russian authorities to respect the Constitution and the Convention on Human Rights. He resented the fratricidal war in the Donbass [Ukraine]. He criticized officials and security forces that routinely violate Russian laws. He stood up for tolerance and against violence. And now he is in jail for his civic stand. 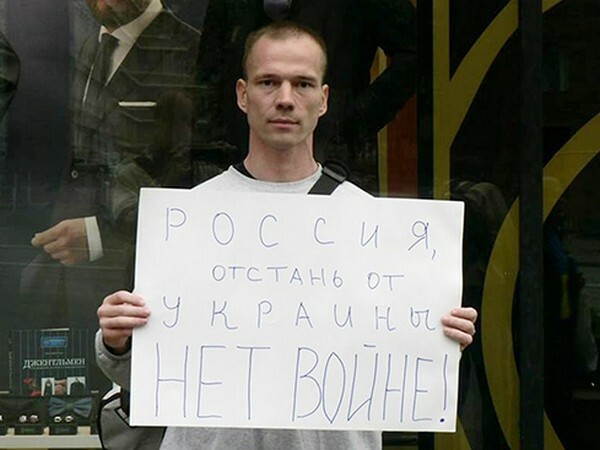 It is noteworthy that Ildar mainly participated in single-person pickets that are not prohibited by Russian law. The police detained him anyway and then falsified reports and invented law violations. The poster reads: Russia, leave Ukraine alone. No War! He was known as a strong young man who never physically resists arrests but cites the Constitution and demands the Law on Police to be obeyed: a policeman must introduce himself, announce the reason for detention, and show his documents on a citizen’s demand. Ildar has learned legislation by heart and quoted from memory. Enraged policemen beat him in cars and in the precincts, tied his hands and feet, sealed his mouth with duct tape. He was repeatedly threatened by authorities and advised to leave to avoid the arrest. ZZ: What are Dadin’s requirements to the Russian government and Putin? Observe the Constitution. Respect international law. Dadin stands for the freedom of political prisoners; for freedom of expression and peaceful assembly. He is against the lawlessness, the brutality of police officials, torture and beatings, election fraud, unjust sentences, and corruption. ZZ: Do you think that such requirements can be fulfilled by the existent, criminal in my opinion, regime? I don’t know if Dadin believes it is feasible; nevertheless, these are his requirements. ZZ: I believe that the only solution is the replacement of Putin’s regime and a psychological recovery program for the whole society. What does Russian opposition believe should be done? Do you or Dadin have specific proposals to amend the current political situation? Dadin is not a politician, and he does not have suggestions regarding a specific candidate for president or prime minister. He insists that any lawfully elected government must comply with the laws and demands transparency of procedures (i.e. elections without fraud). 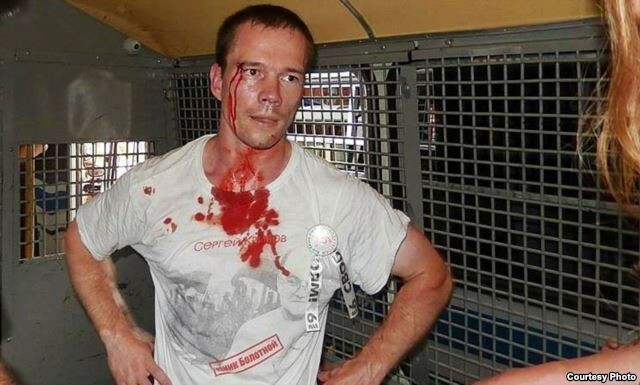 ZZ: How can the world community help Ildar Dadin and other political prisoners in Russia? The interest of the international community, human rights organizations and authorities might guarantee that Dadin will survive the imprisonment; that he will not be killed or injured. We know that during the Soviet era the foreign governments inquired with the Soviet authorities about the fates of dissidents in prison. Similar measures might help save Dadin’s life that we believe is in danger. Insulted by Dadin’s demands for prison management compliance with the Penal Code and the rules of the detention, the police beats him on a regular basis and has transferred him to a special detention area. His close friends and family are concerned about his safety. A solitary violation of the law, for example peacefully gathering without the authorities’ express prior permission, is punishable by a fine or up to 15 days’ administrative detention. Three such violations result in a criminal offense punishable by up to five years’ imprisonment.